We may think that social media and the way that people behave on it is a modern, digital tradition. But a new exhibition at the British Library reveals that's not really true. Around 400 years ago, people were already collecting friends, 'liking' people's pictures, sharing music and images, and leaving each other messages in exactly the same way as people do on social media today. The difference was that they didn't have phones and computers to do it on. 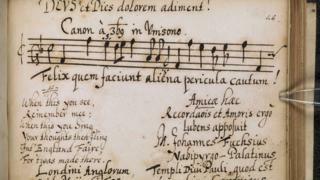 They did it in something called alba amicorum - or 'friendship albums' - and the British Library is displaying a collection of them in a new exhibition called Friendship Before Facebook. 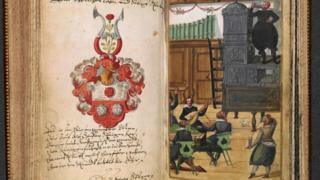 Friendship albums were special books which people used to show off their social circle hundreds of years ago. They were used between the 16th and 19th centuries. Quiz: How well do you know these famous friendships? They first appeared in the mid-16th Century when Dutch and German students used them as a way to record and remember their studies abroad. 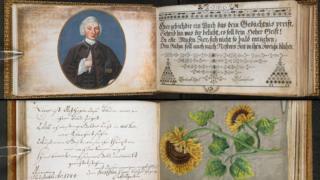 Andrea Varney, co-curator of the exhibition at the British Library, explains: "The fashion for friendship albums spread to other parts of Europe, and they were soon used by musicians, artists, lawyers and all sorts of other people." They are full of celebrity autographs, music notes, little paintings and drawings of parties and feasts, and interactive lift-the-flap pictures. "People asked new friends and contacts to sign their books, add wise or funny sayings, and sometimes a personal coat of arms or a miniature painting, often made by a local artist," says Andrea. 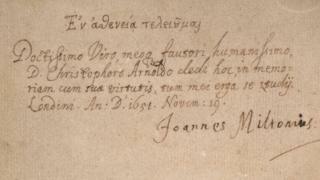 One book in the exhibition which belonged to a Scottish man called Thomas Cuming includes the signature of King Charles I! The albums ranged in size, but they were never very big and were typically carried in small pouches or pockets. People would use them as a way to shape their public identity, much like a lot of people do with social media today. "They reveal that, even in Shakespeare's day, people collected and showed off their friends and professional contacts," says Andrea. "If a celebrity such as the future King Charles I signed a friendship album, people placed it near the front - a bit like a celebrity selfie today. The albums are multimedia and interactive, like Instagram or Facebook." So why did they stop being used? 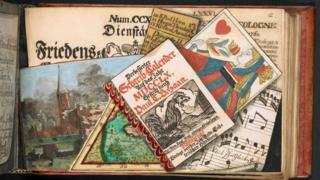 Andrea told us: "They developed into autograph books and visitors' books in the 19th and 20th century. Nowadays, we're probably more likely to collect and display our friends, or share our tastes and talents online." The idea behind the exhibition of these books is that it will get visitors to think about how friendships work nowadays and why we behave the way that we do with our friends. What do you think about the idea of these books? Do you think this is something that could work nowadays? Or do you think friendships are too digital for something like friendships albums to work anymore? Let us know in the comments below! Its basically social media the paper version!